Technology just keeps getting better and better each year. The things that took a whole studio full of expensive equipment, highly trained engineers, and the perfect musical environment is now available to anyone who wants it. A professional, high quality microphone for singing at home is within everyones grasp and budget. Something that used to cost thousands and thousands of dollars can now be had for a fraction of the cost right in your own bedroom, living room, backyard or basement. Just plug it in and go! No wonder there are so many aspiring singers and musicians showcasing their talent online and live year after year. When you purchase one of these microphones for singing at home you know you’re getting exactly the right mic for the right purpose. You can be assured of quality, durability, and value for your money spent. Thousands upon thousands of users, and that’s just from Amazon, swear by these microphones. Each one of them for the specific purpose of recording yourself, or just singing out loud, in the privacy of your own home can get you the desired result..and more. Our list below of the top brands would be very hard to beat. And if you want the best the market has to offer choosing any of these would be the perfect choice. Audio-Technica AT2035 XLR Condenser Microphone (read review) – Our top pick for the absolute best at home singing/recording experience. 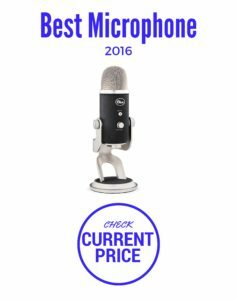 Not as plug-and-play as the other USB microphones in our round-up but it easily takes first place when it comes to the finished result. Coming from the well-respected and fantastically designed Audio Technica family of microphones, the AT2035 will leave you speechless when you hear how good you can sound. 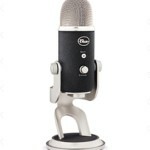 Blue Microphones Snowball USB Microphone (read review) – This is Blue Microphones offering that has it’s inspiration rooted in the classic recording equipment of years gone by. It’s stylish, retro, and compliments any system, or laptop you use it with. Both the Snowball USB and it’s little sibling the Snowball iCE Condenser Microphone can easily make you sound amazing when you’re singing and nothing but fantastic quality will do. 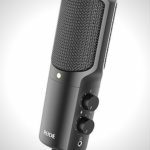 Rode NT-USB Condenser Microphone (read review) – Designed to deliver clear and solid sound for any type of vocal, music or instrument recording. The Rode NT-USB has legions of fans and it just keeps getting better. This is their recent entry into the ‘USB’ world and should definitely be on your short list if you’re looking to sound great within a budget.